Find a world of seafood in Brussels! View the fair’s location on Google maps. Since 1 January 2018, in order to improve air quality and therefore public health, Brussels has been declared a Low Emission Zone. The new regulation affects passenger cars, vans ≤ 3.5 tons, and buses & coaches, whether registered in Belgium or abroad. Registration via the LEZ website is compulsory for vehicles registered abroad or you may receive a fine of €350. For more information and all regulations, please visit https://www.lez.brussels/en. 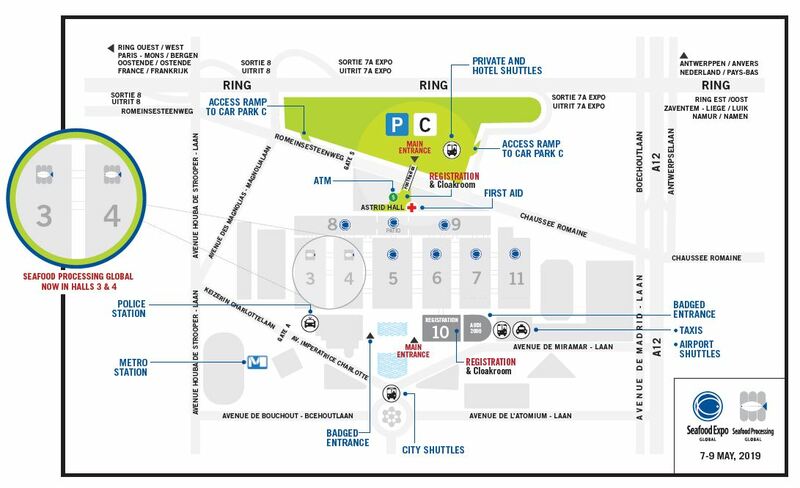 If you are driving to the expo, Take Exit 7A and use Car Park C connected to the Astrid Hall entrance of the exposition. This convenient location offers plenty of parking spaces and has its own registration area and entrance hall with direct access to the exhibit halls. If you arrive by taxi, bus, shuttle or metro – use the entrance and registration located in Hall 10 to access the exhibit halls. The drop-off and pick-up area for private and hotel shuttles has moved to Car Park C. Please make sure to communicate this new information and map to your private shuttle company. Please note that members of the press can use either Hall 10 or Astrid Hall to pick up their badges.